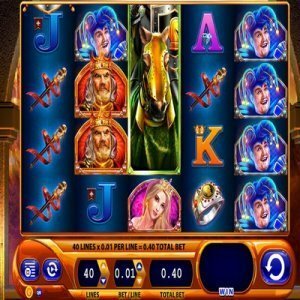 [miau] Black Knight II is an online slot machine game that is meant to be a direct sequel to the wildly popular Black Knight, which was released a few years ago. Part of what made it so popular at the time was the medieval theme and stellar graphics used. As slots players know, there isn’t that much variation between one game to the next. However, with Black Knight, players are transported to another part of history, wherein they can play along in an interactive fashion while attempting to win money. The sequel in this franchise, Black Knight II, is powered by WMS and features a ton of bells and whistles that slots players of all stripes are bound to appreciate. Black Knight II is a 5-reel, 40-payline slot machine released on the WMS Gaming platform. WMS is known for graphically intense online casino games that give players a high-quality gaming experience from the eye-popping colors to the true-to-life statistical probabilities of the games themselves. With its medieval theme, II picks up where the original Black Knight left off, giving players tons of cool symbols, such as Knights, Kings, Jesters, and various period appropriate medieval symbols. One of the best features of Black Knight II is that its potential payout is incredibly high, particularly when compared to similar slot machines. Although the bonus game (prompted by earning 3 Black Knight Shield symbols) only gives away 7 free spins, and even though there isn’t a retrigger here, the reels can still be expanded quite a bit and the potential for winning big money is there. That alone makes this game a favorite amongst gamblers. The possibility of winning big money on a slot machine, rather than some nickel and dime profits, is appealing to gamers of all ages. Part of what makes Black Knight II a unique slot machine is the overall betting structure. You don’t have to risk everything in your account to play this game. If you only want to bet a penny or two on a couple of lines, you can custom-tailor your betting range and spread things out amongst the 40 different paylines. You can bet anywhere from 00.1 to 3, which leaves you able to bet a maximum of 120 over the span of all 40 lines. Although Black Knight II has received a bit of criticism for its limited number of free spins awarded, there are still many different ways to win. For instance, the scatter symbols, which are also wilds, enables players to easily increase their odds of winning on any particular line or combination of different lines. Players have reported big winnings on this machine, and even casual players appreciate a game that’s fun and that has a medieval theme and that doesn’t require them to bet a ton just to play. You can space things out, custom bet any combination of lines, and even select the autoplay if you want to go on more of a cruise control type of approach. This is a slot game that’s fun for gamblers of all tastes.